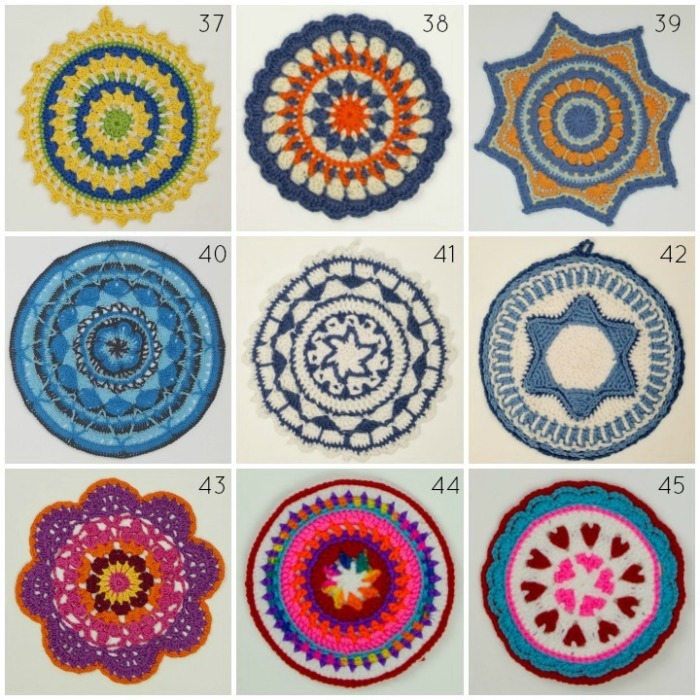 Home ♥ Blog ♥ Crafts ♥ Yarn ♥ Crochet ♥ 51 Glorious Mandalas on my Mandala Wall! 51 Glorious Mandalas on my Mandala Wall! My mandala wall has made me smile for close to two years now. It is my happy space! 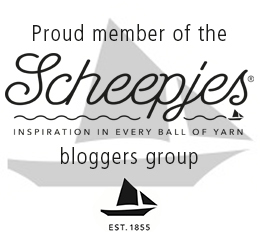 It reminds me of the glorious, talented network I have built up since I started crocheting and designing. It also reminds me of the kindness and generosity this community embodies. Doesn’t that just tie in so nicely with the upcoming Ubuntu CAL 2018 and the theme behind it? The post below was meant to be a New Year’s post for 2017! It was all written, just waiting for me to press the publish button. Somehow, that never happened! I wondered whether I should re-write it, but I’ve decided to let 2017 me have her say. She has been a trooper these last 2 years! So, if you are as enamoured by mandalas as I am, grab a cuppa and a notepad and settle down with me on this beautiful bank holiday Monday as we travel back to January 2017. 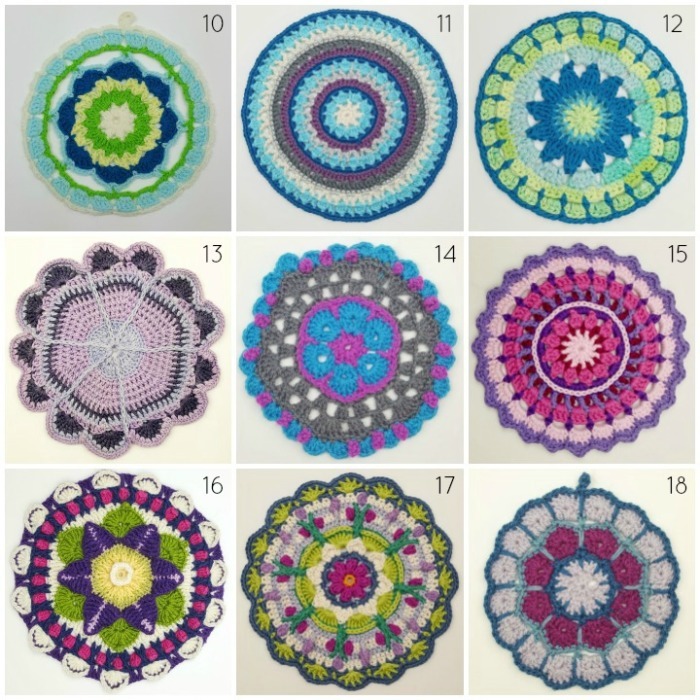 You are going to want to scribble down some of these mandala pattern links. Ps. Present me might make some comments (in BLUE). I hope you all had a wonderful festive season and that January has not been a blue month for you so far. 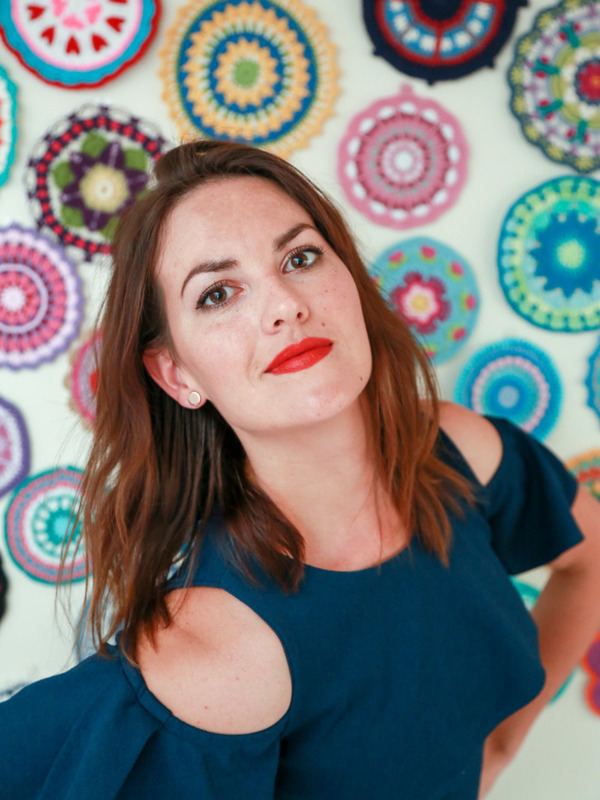 I am starting my blogging year in front of my gorgeous new Mandala Wall. If you haven’t heard me talking about the wall yet, you’ll hear me talking about it plenty today. I don’t know if you can remember that I went to Yarndale last year. 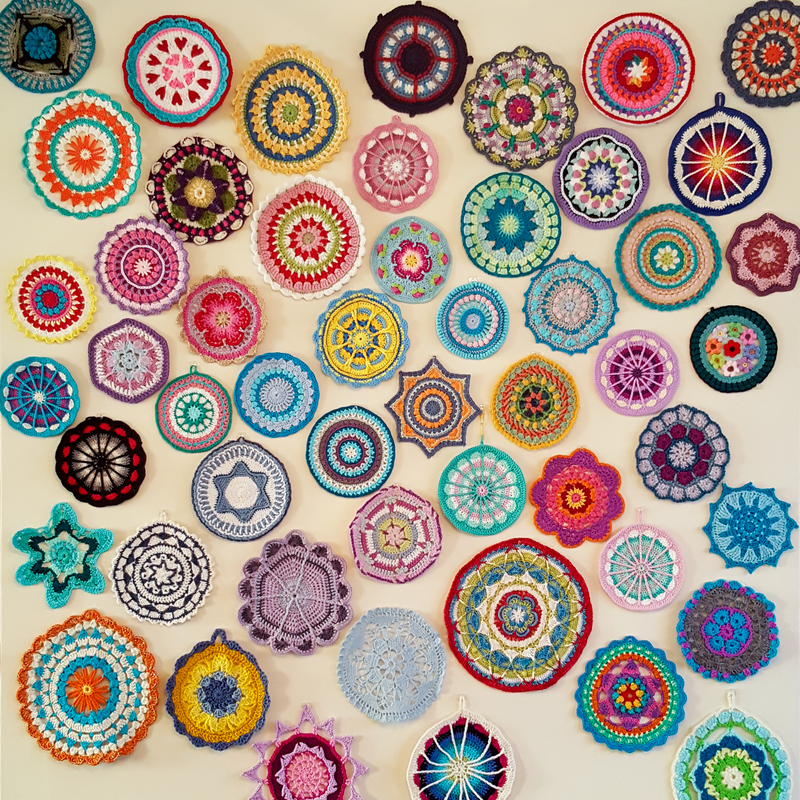 When I was there, I saw this gorgeous Mandala Wall (I will be going to Yarndale again this year and hope to see you there!). 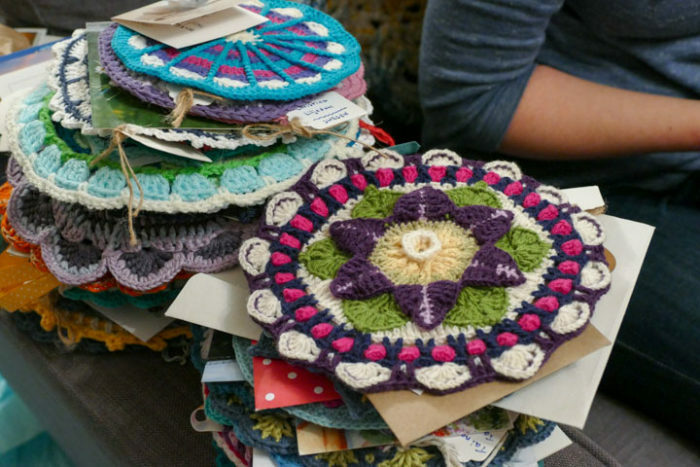 The mandalas were made by people from all over the world, specifically for Yarndale 2014 (you can read more about that HERE on Attic24), and to see them in real life was such a treat. 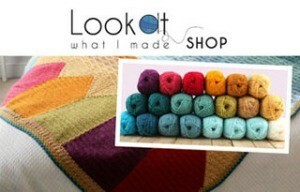 I posted a photo of the Yarndale Mandala Wall on Facebook, saying that I would love a wall like that. I forgot all about the comment and the mandalas until three of my friends arrived at my door one evening with a big box full of individually wrapped mandalas. I cannot tell you how special and emotional I felt opening the little parcels and (much later) reading all the touching notes and letters. It took us (me and the boys) a good 20 minutes to open them all. The boys kept shoving mandalas in my face in their excitement to show me the ones they had opened. It was quite chaotic and overwhelming. It took me quite a while to decide where and how I would attach the mandalas. Did I want to buy a pegboard? Did I want to frame them? Did I want to place them randomly or in a shape? In the end, I decided to use clear Command hooks from 3M and just place the mandalas randomly (although I still have my eye on a gorgeous pegboard). I chose the wall in our dining room because that is where I sit and do all my work, and I wanted to be able to see the mandalas all the time. 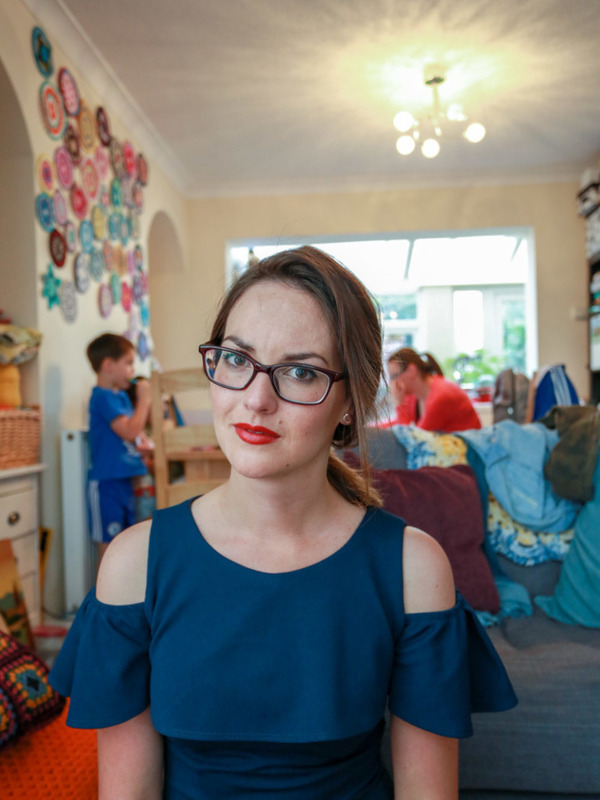 This is a photo my brother-in-law (Cameron) took of my sister (Ance) on Christmas Day. You can see my blurry self behind her (right), answering a quick email. The boys (left) were playing spies below the mandala wall, bobbing up and down behind the table to scare me. Rewind five minutes and you get this: a playful Ance-moment (Ance-moments are the best) while Cameron tries to take a profile photo of her for her blog in front of my Mandala Wall (that might have been my suggestion and she might have been standing on a chair to better showcase the mandalas). The thing I like the most about the mandalas is that each of them has a story. The pattern, yarn, and colours were chosen specifically and mindfully. A lot of the mandala girls even saw this as an opportunity to design their own mandalas – a first for many of them. I have tried my best to catalogue all the mandalas below, but if I have made a mistake (or you know more about a design than I do), please let me know so that I can make this a comprehensive list. 2. Maxine Timms – “Dainty Daisy” from Haafner Linssen’s book, Mandalas to Crochet (book available on Amazon US and Amazon UK). 3. Jolanda Verschiere-den Toonder – Dainty Daisy (see above). Both these mandalas are particularly special because they feature daisies. My favourite flower is a Barberton Daisy (hence my Instagram name). 4. Pat Laurenti – First part of Debi’s Mandala for Marinke (paid pattern). 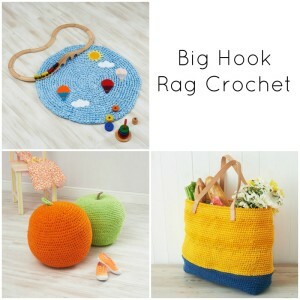 I have loved following Pat’s crochet journey in person. She has grown so much since she first started crocheting. Every time I look at her mandala, I am reminded of this shared journey. 5. Mia-Mari Lepistö – “Brainstorm” is Mia-Mari’s own design. The pattern is not available yet. 6. Teresa Sánchez – Isn’t this cute? I have absolutely no pattern information for this one. 7. Yaël Waaker – Starflower Mandala by Zooty Owl. I love the blues! 8. 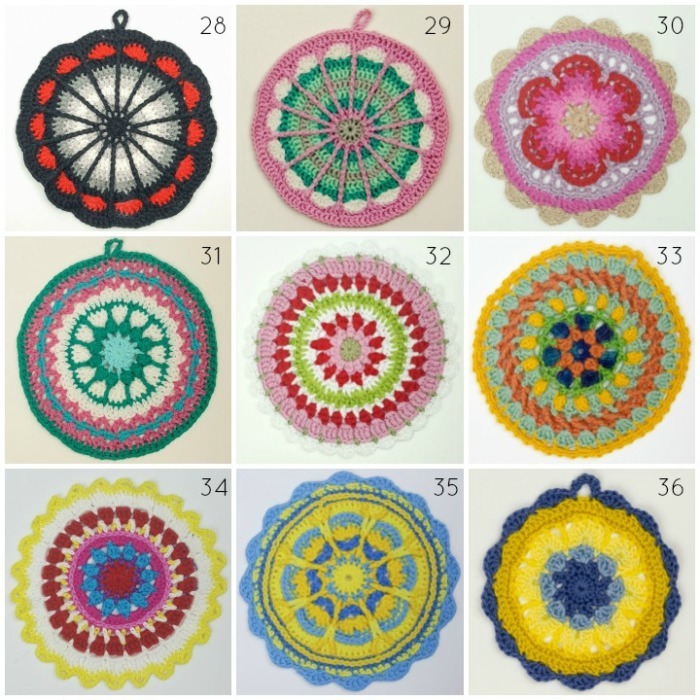 Kay Crone – Kay started with the first 4 rounds of “Seashell Coaster” from Crochet Mandalas by Marinke Slump and Anita Mundt (book available on Amazon US and Amazon UK) and then made the rest up as she went. Kay is one of my ‘helpful fairies’ and a very good friend. 9. Heli Isoniemi – No pattern details for this one except that it is a pattern from a Finnish magazine. Isn’t it beautiful?? 10. Kitty Luijkx – Autumn Spice Mandala by Elizabeth Ann White. The colours in this one go really well with no.12 below. 11. Saraphir Qaa-Rishi – “Flower Wheel Mandala” is Saraphir’s own design. 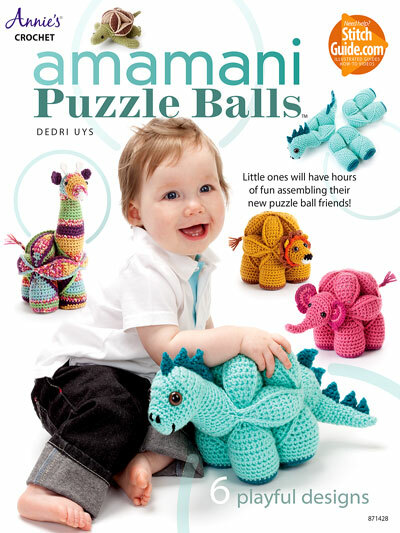 The pattern isn’t available yet, but you can see Saraphir’s other gorgeous designs HERE. 12. 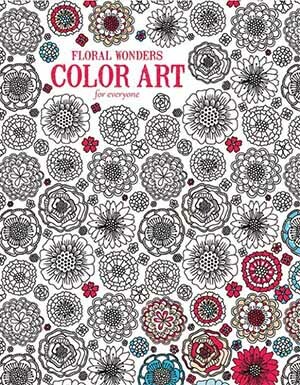 Gabriela Meroni – Sunny Flower Mini Mandala by Zooty Owl. 13. 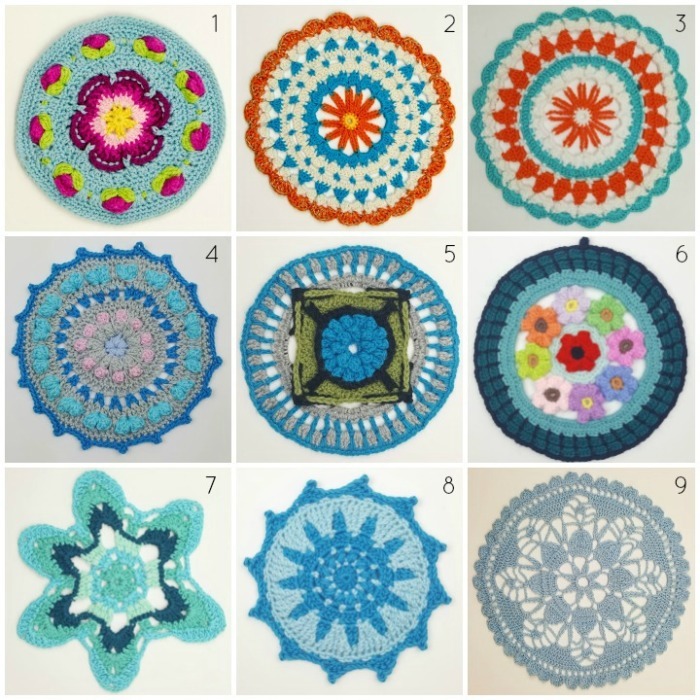 Lynnette Wilkie – This pattern is from The Big Book of Crochet Mandalas (a supplemental booklet for Crochet Now Issue 5). This mandala is particularly special to me because one of the “hearts” has an extra hump (she didn’t frog it because she knows I like imperfections) and she made it out of the Vinnis Nikkim my mom gave her. 14. Elisabeth Larsen – This is Elisabeth’s own design (pattern not available yet). 15. Dania Olsen – Little Spring Mandala by Made in K-Town. This is such a pretty design! 16. Pia-Mari Winqvist – “From Me to D” is Pia-Mari’s first design. She says she just followed her crojo and can’t really remember how she made it. I hope she has remembered now! 17. Taina Tauschi – This mandala is Taina’s first design, inspired by the colourful marketplace in her hometown, which she describes as “the heart of the city”. The pattern is not available yet, but isn’t it gorgeous? 18. 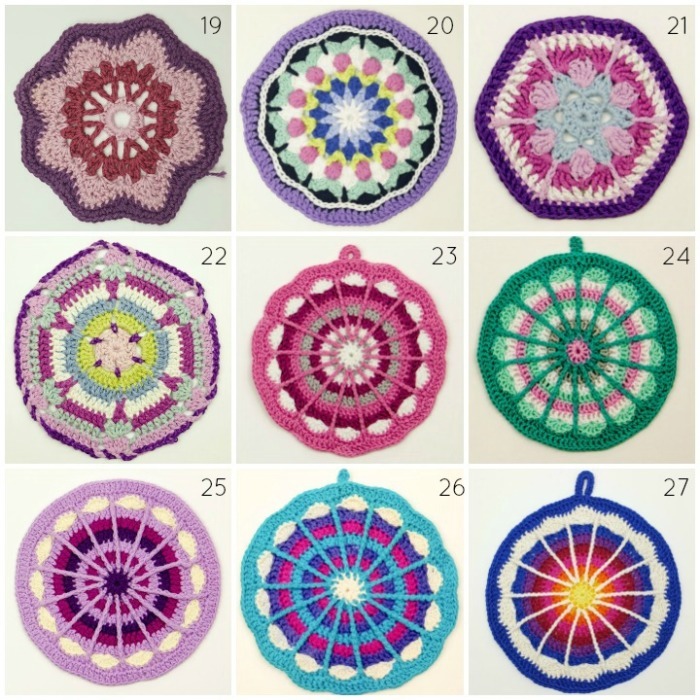 Massiel Lago – Magic Spike Mandala by Moogly (another favourite pattern). 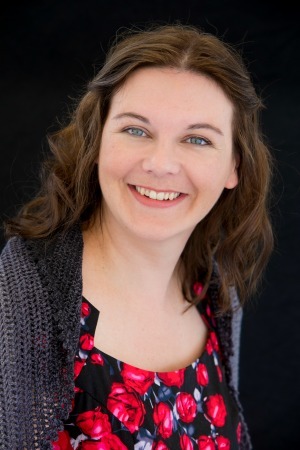 Massiel is heavily involved in translating crochet patterns for various designers, so I thought I would take a moment to thank her for all the work she has done for this community. 19. Sara Hailstone – This is Sara’s own design (pattern not available yet). 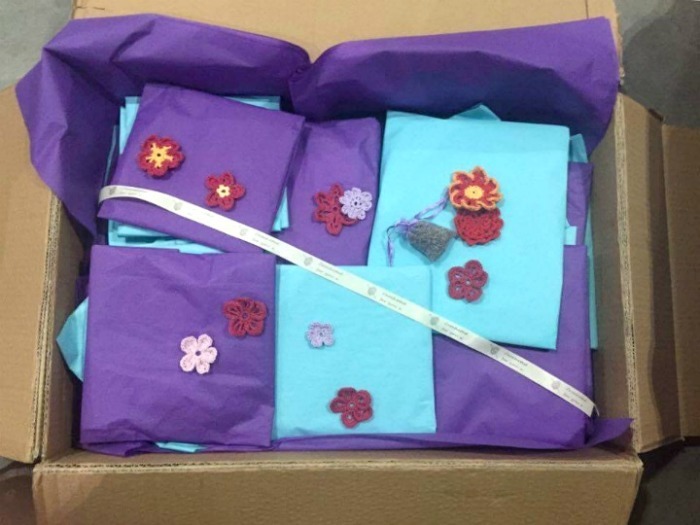 Sara also sells vintage sewing bits on Etsy and I love following her Instagram account. It makes me want to get my sewing machine and super old patterns out. 20. Mona Llau – This is the first part of Tulip Mandala by Lisa Berglund. It reminds me of my Wishing Well square, even though it looks very different. 21. 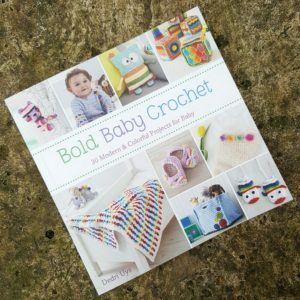 Claire Sutcliffe – The pattern is from “a booklet that came with my Simply Crochet magazine a few months back”. If any of you have more details about the specific pattern, please let me know so that I can add it here. 23. Christina Liljedahl – Spoke Mandala by Wink. 24. Åza Karlsson – Spoke Mandala by Wink. 25. Agnetha Magnusson – Spoke Mandala by Wink. 26. Emma Vingqvist – Spoke Mandala by Wink. 27. 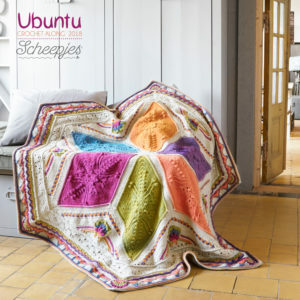 Minno Baarman – Spoke Mandala by Wink. These Spoke Mandalas from the Swedish girls (and the two in the next photo) are very special to me. When I look at them, they remind me of Wink. They remind me to be kind to myself and to others. They remind me to be grateful! 28. Annie Susanne Ekberg – Spoke Mandala by Wink. This mandala arrived without anyone knowing who had made it. It was quite a mystery. After a few days, Annie confessed that she had made it, but hadn’t felt confident enough in her own crochet skills to own it as hers. She actually asked Åza (below) to make one on her behalf and she then made a donation to a children’s charity in payment to Åza for making it. 29. Made by Åza Karlsson on behalf of Annie Susanne Ekberg (above). 30. 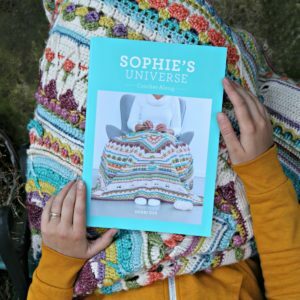 Esther Dijkstra – Sophie’s Universe Part 1. 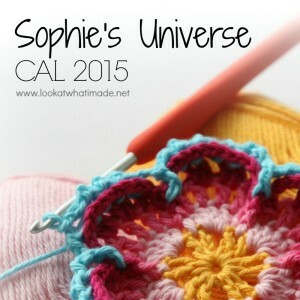 Esther did all the video tutorials for Sophie’s Universe, so this little mandala is very close to my heart :) If you haven’t seen Esther’s step-by-thorough-step videos yet, do yourself a favour and go look right now! Esther will also be doing the videos for Ubuntu 2018. 31. 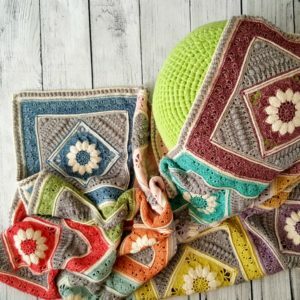 Dorine Brökling – This pattern is from the Princess Mandala Throw by Annamarie Estherhuizen (paid pattern). 32. Gloria Sèlomè – Petals and Puffs Mandala by Bunny Mummy. Don’t you love the pinks with that pop of green? 33. Mervi Järvensivu – This pattern is Mervi’s own design. She originally made it in darker colours, but decided that I needed sunshine colours instead :) The pattern is not available yet. 34. Ida de Witte – Little Spring Mandala by Made in K-Town. These colours make me think of Cath Kidston. 36. 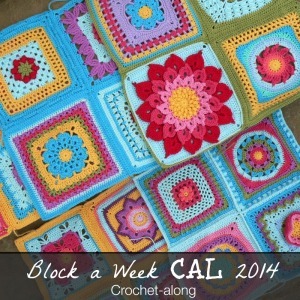 Cath Pair – “Sunshine and Blue Skies” was adapted from a floor rug in an old crochet pamphlet. I love the sunshine yellow! 38. Sari Silventoinen – Little Spring Mandala by Made in K-Town. This pattern is popping up a lot, isn’t it? I love how each colourway makes it look completely different. 39. Sari Åström – “Anastasia” is Sari’s own gorgeous design, and yours truly got to pick the name! It reminds me of Portuguese tiles and a Portuguese friend from my youth. You can guess what her name is :) You can find the free Anastasia pattern HERE on Ravelry. 41. Sarit Grinberg- This is Sarit’s own special design, reflecting the love of her country (Israel). The pattern isn’t available yet, but you can find Sarit’s other patterns HERE on Ravelry. 42. Iris Fait – “For the Memory of Shimon Peres” is Iris’ own design, made while watching the funeral procession of Shimon Peres. You can find the free pattern HERE on Ravelry. 43. ChiChi Allen – This mandala is ChiChi’s own design (pattern not available yet). If you are not familiar with ChiChi’s work, please do yourself a favour and have a look at her ‘Around the Bases’ CAL. 44. Betty Pintado Diaz – Mandala Wheel by Attic24. Betty LOVES colours and this mandala has plenty! 46. Jo Navin – This Mandala Wheel was made by a very special friend of mine :) I love that she put a bit of glitter in there! 47. Boadicée Picquendar – North by Northwest by the talented Polly Plum (free pattern). 48. Lynda Hernandez- Lynda designed this mandala herself (no pattern yet) and it is special to me because Lynda was one of my translators for Sophie. She has since become a very dear friend. 49. Lynnette Wilkie- Sophie’s Mandala (Large). Lynnette made this Sophie in Nurturing Fibers Eco Bamboo. It is special for many reasons! One of those reasons is that it is a visual reminder of the day I spent at Nurturing Fibres with Be Inspired when we were in South Africa. 50. 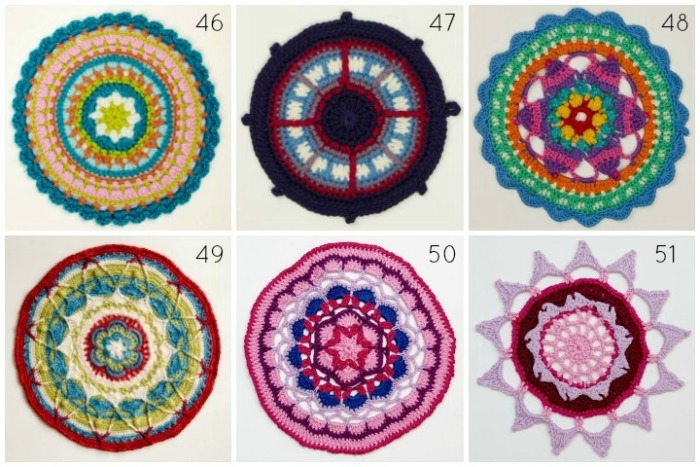 Susan Ruff – This mandala is from Haafner Linssen’s book, Mandalas to Crochet (book available on Amazon US and Amazon UK). It rounds my pink collection off nicely. 51. 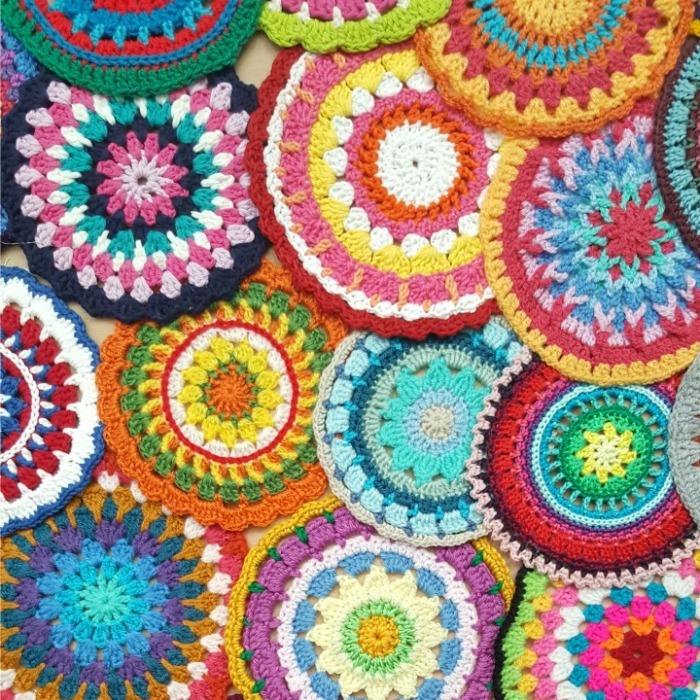 Susan Ruff – Crochet Mandala by Rachel Thompson. Wow, that took me quite some time to do!! I will leave you with this Instagram photo of Maarit’s tiny Sophie. You can see more photos of the mandalas by searching #dreamingofmandalas on Instagram. Did I not mention yours in my list? I’ll have to fix that! They are all quite beautiful and how lovely that they were a complete surprise for you. I went to Yarndale in 2016 too. We were on a UK holiday from Australia for five weeks and I made sure our itinerary worked so we could go to Skipton for a day. It was fantastic.